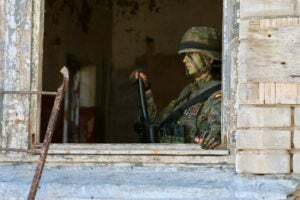 SKRUNDA-1, Latvia—On June 13, the sounds of gunfire and controlled detonations thundered within the abandoned apartment blocks at this former Soviet radar station about 90 miles to the northeast of Russia’s Kaliningrad exclave. On this day, as part of an annual military exercise in the Baltics called Saber Strike, a joint NATO assault force simulated the liberation of a Latvian town from an unnamed invasion force. The crux of the simulated battle occurred over an open, concrete expanse in the heart of the Soviet-era ghost town. 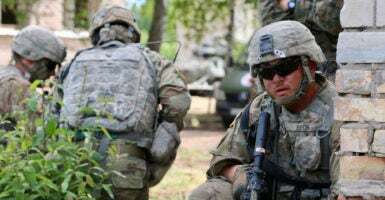 The Daily Signal was on the sidelines to observe as the liberators—a joint NATO force including U.S. Marines and U.S. Army soldiers—swept in from the surrounding wood line. Their objective was to “inflict maximum casualties on the enemy,” a Latvian military official announced over loudspeakers. A combined force of Latvian and Spanish soldiers played the role of the holed-up adversary, which the NATO assault force fought to dislodge. After a simulated gun battle, an American armored Humvee skidded to a stop on the concrete, central square. The turret gunner opened up with his .50-caliber machine gun. Then, under covering fire, the U.S. forces advanced and aggressively cleared the town’s buildings. Minutes later, with the retreating adversary on the run, the radios crackled with the voice of a Latvian Joint Terminal Attack Controller, or JTAC—a soldier specially trained to call in airstrikes. In flawless, barely accented English, the Latvian JTAC radioed a four-ship of U.S. Air Force A-10 “Warthog” attack aircraft, guiding the U.S. warplanes toward their targets. 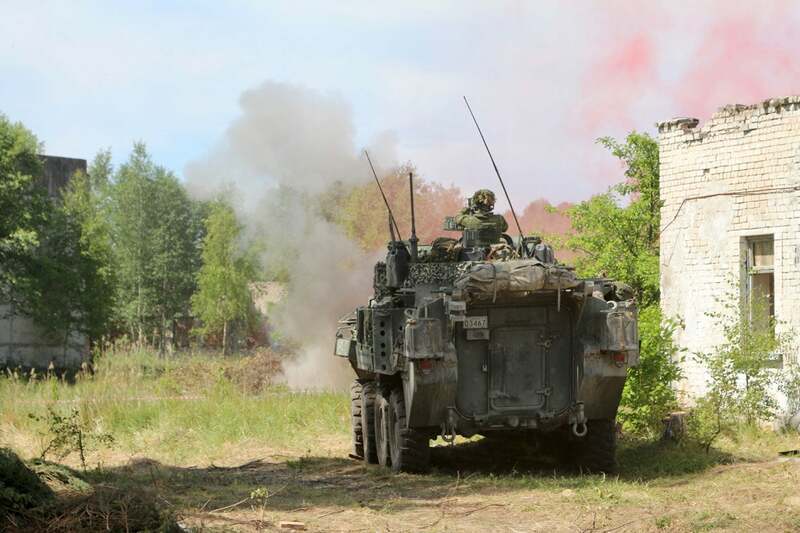 “The JTACs give Latvia a capability to punch way out of its weight class,” Maj. Gen. Gregory Vadnais, adjutant general of the Michigan National Guard, told The Daily Signal from the sidelines of the simulated battle. The venerable A-10s—designed in the 1970s to take out Soviet tanks—came in low and fast. You could hardly hear their approach until the last minute before they screamed over the surrounding treetops. NATO’s Saber Strike exercise was meant to deter Russian aggression in the Baltics. After dropping their simulated payloads, the U.S. warplanes banked hard, as they would in an actual battle to avoid ground fire. A series of controlled detonations simulated the concussive effect of real bombs. An American voice on the radios announced that a 360-degree defensive perimeter had been established around the town. The battle was over. The town was secured. The invaders were presumably annihilated in their retreat by the A-10s. 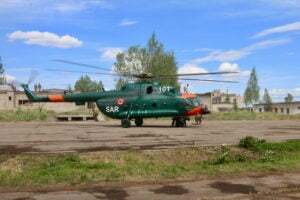 Finally, under the direction of the Latvian JTAC, a Latvian search and rescue helicopter (a Russian-made Mi-17) descended into the town square to pick up the wounded. From June 3 to 15, the U.S. Army-led Saber Strike exercise took place in the four NATO countries of Poland, Latvia, Lithuania, and Estonia—all of which share a land border with the Russian Federation. The exercise, in its eighth year, comprised 19,000 total troops from 19 countries, including NATO’s four enhanced forward presence armored battle groups in the Baltic region. Those four rotating, armored units of about 1,000 NATO soldiers each were put in place in 2016 due to Russia’s invasion of Ukraine. While Russia was not explicitly called out as the simulated adversary, NATO personnel said Saber Strike was meant to send a message to Moscow about the alliance’s resolve to defend the Baltics. Vadnais had a similar take on the exercise’s message to Moscow. “Any adversary will pay dearly for every meter of ground they try to take in this country,” the U.S. major general said. 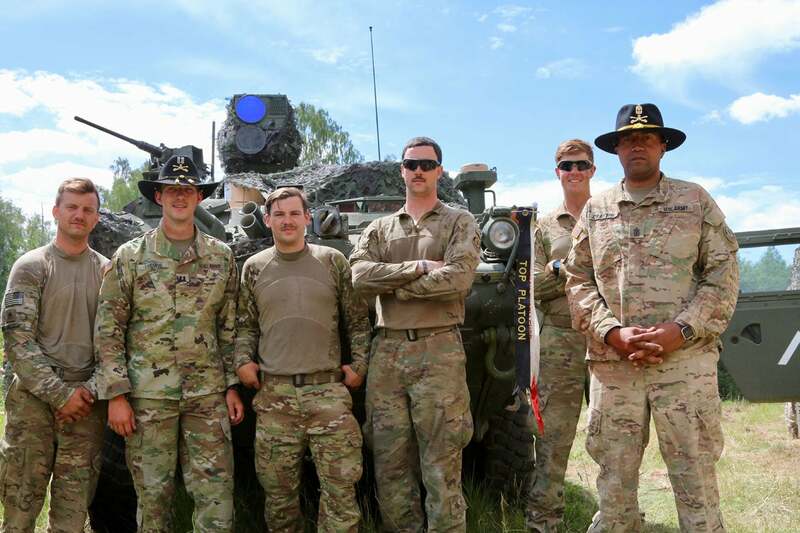 U.S. Army soldiers from the 2nd Cavalry Regiment pose in front of their Stryker armored fighting vehicle in Latvia during the Saber Strike exercise. A war to liberate the Baltics from a Russian invasion would be a high-intensity, dynamic, and chaotic fight. It would comprise tank battles, heavy artillery, rockets, and a lethal surface-to-air missile threat. NATO forces would not enjoy air superiority at the outset, and they would face an electronic warfare environment in which communications would be spotty and an errant radio transmission could get you killed by Russian artillery. The U.S. and its NATO allies have a generation of experience in what it’s like to go to war—but not that kind of war. “We focused on something different for the last decade and a half—now, we’re relearning a lot of our conventional skills,” Canadian Lt. Col. Sean French, commander of NATO’s enhanced Forward Presence Battle Group in Latvia, told The Daily Signal on the sidelines of NATO’s Saber Strike exercise. “This is absolutely different from a counterinsurgency fight,” French added, describing the Saber Strike exercise, which simulated a conventional warfare campaign to liberate the Baltics from an invasion force. Altogether, Saber Strike simulated a battlefield environment far different than the counterinsurgency campaigns in Afghanistan, Iraq, and Syria. 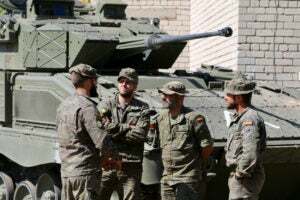 It also exposed NATO forces to the logistical challenges of supplying rapidly advancing armored forces while exposed to artillery and aerial threats. A Spanish soldier plays the role of an invading soldier during the Saber Strike exercise. “This isn’t [counterinsurgency], this is a high-intensity conflict. Everything is different, we don’t assume our superiority,” said U.S. Army 1st Sgt. Christopher Creighton, from the U.S. Army’s 2nd Cavalry Regiment. More than 950 soldiers from the 2nd Cavalry regiment convoyed overland to the Saber Strike exercise from their home base of Vilseck, Germany. U.S. military personnel said one key challenge of an exercise like Saber Strike is learning how to operate alongside NATO partners in the chaos of the conventional, maneuver warfare environment. With that in mind, U.S. troops were quick to acknowledge some other intangible benefits of the exercise—most notably the building of personal relationships with their allied counterparts. Tensions between NATO and Russia have been high since Russia’s 2014 invasion of Ukraine. After more than four years of constant combat, the war in Ukraine is not over and the spectre of a war with Russia still looms large over NATO’s Baltic countries of Lithuania, Latvia, and Estonia—all three of which used to be part of the Soviet Union. NATO officials regard the Baltic region as a potential hot spot where tensions between Russia and the West could spiral out of control into a shooting war. Geographically, the Baltics are pinched between mainland Russia, Russia’s Kaliningrad exclave, and Russia’s ally of Belarus. The only land corridor from the Baltics to the rest of the NATO alliance is through the 60-mile-wide Suwalki Gap connecting Lithuania to Poland. NATO’s 2018 Saber Strike military exercise comprised 19,000 soldiers from 19 different countries. Some eyebrow-raising think tank reports since 2014 have suggested that Russia’s military forces in the Baltic region could rapidly overrun NATO’s defenses. 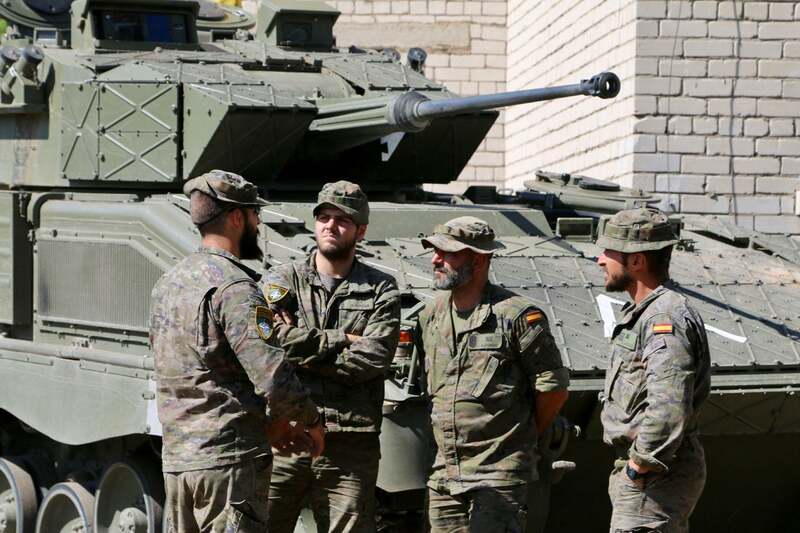 With the Russian threat in mind, following the July 2016 NATO summit in Warsaw, the alliance began rotating four battalion-size, combat-ready battle groups throughout the Baltic region. Of those forces, the U.S. has about 800 troops stationed in Poland, including a squadron of Stryker armored fighting vehicles with towed artillery. For their part, since 2014, NATO’s Baltic countries have embarked on a crash-course militarization program meant to improve their ability to resist a Russian invasion. Nearby Poland has also ramped up military spending for the same reason. Latvia’s national security doctrine calls for the mobilization of its civilian population to wage a partisan resistance war if Russia invades. Thus, exercises like Saber Strike send an important message to the Latvian people that they can count on NATO security pledges. Canada leads NATO’s multinational battle group in Latvia. The unit comprises more than 1,000 troops from various countries deployed to Latvia on a rotational basis. Some military experts say NATO’s rotating battle groups are “tripwire forces” incapable of repelling a Russian invasion—their presence is presumably meant to deter Russia from an attack due to the risk of spurring NATO to defend its forward units. For his part, French pushed back against the notion that his battle group was a tripwire force. 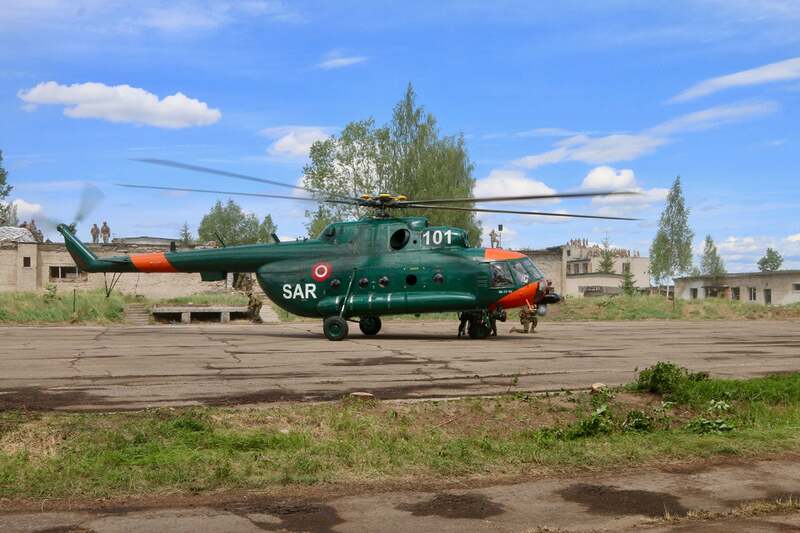 A Latvian search and rescue helicopter descends on Skrunda-1 to simulate the evacuation of battlefield casualties. 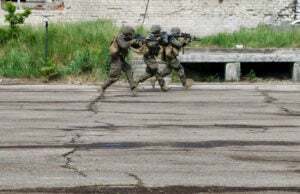 If Russia invaded the Baltics, U.S. special operations forces would lead the way and rapidly deploy to wage a covert, resistance war alongside the region’s indigenous territorial defense units. The unconventional warfare operation would clear the way for a counteroffensive by NATO’s conventional military forces. “[Special operations forces] is designed for one thing, we’re designed for something else,” French said of the role of NATO’s conventional units in the defense of the Baltics. For the U.S. and its NATO allies, the war in Ukraine has been a case study in how Russia goes to war. 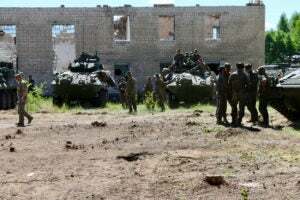 “Ukraine is like a training range where the Russian military practices,” said Bergmanis, Latvia’s defense chief. Among those lessons: In a hypothetical war with Russia, U.S. and NATO forces may not have the ready access to airpower and artillery support that they’ve grown accustomed to in Iraq and Afghanistan. 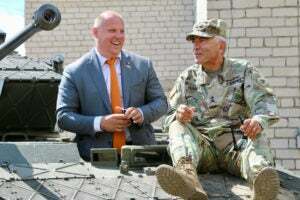 Latvian Minister of Defense Raimonds Bergmanis, left, and Maj. Gen. Gregory Vadnais, adjutant general of the Michigan National Guard, on the sidelines of the Saber Strike exercise on June 13. Another key lesson from Ukraine is the importance of operating with degraded technology. Russian electronic warfare weapons can knock out GPS and communications equipment. Also, Russia can target its artillery and bombs on an adversary’s electromagnetic signature. With the electronic warfare threat in mind, U.S. soldiers say they pay as much attention to camouflaging their electromagnetic emissions as they do to visual camouflage. “Camouflage works in multiple ways—we work to keep our electronic signatures low,” said Capt. 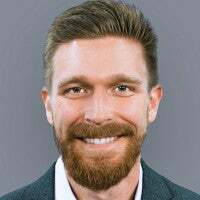 Evan Ludwig from the U.S. Army’s 2nd Cavalry Regiment. “We camouflage our electromagnetic footprint, we conceal our communications—we learned from Ukraine,” said U.S. Army Cpl. Blake Jackson, a member of a heavy weapons company in the Michigan Army National Guard. Jackson, who has deployed to Afghanistan, said Saber Strike was a chance to practice combat skills he didn’t need in a counterinsurgency war. 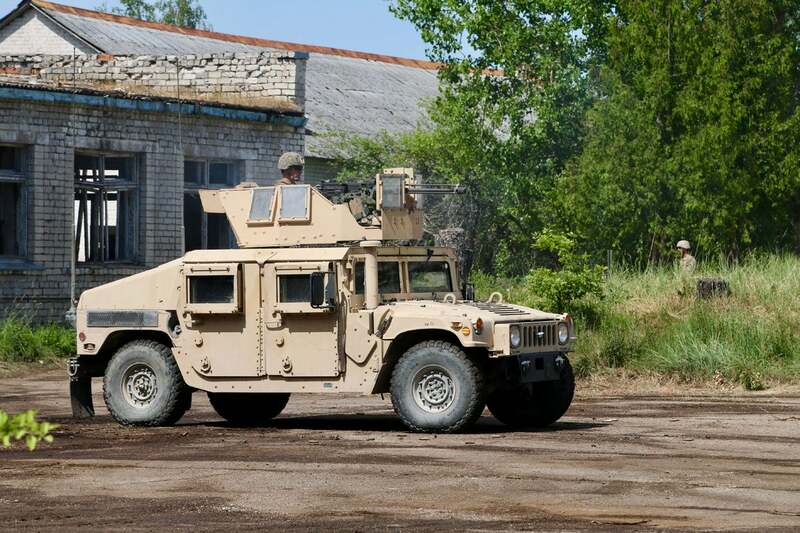 U.S. military forces led the way in the simulated liberation of a Latvian town. Saber Strike took place in a region that U.S. troops are tasked to defend. So, there was a practical utility to rehearsing the logistics of deploying a conventional military force to the Baltic region overland from bases in Western Europe. “It shows Russia that we can deploy on a moment’s notice,” said Ludwig, the captain from the 2nd Cavalry Regiment. Ludwig said his unit deployed to Latvia in 48 hours for Saber Strike. Along the way, U.S. troops scouted the best land routes to deploy their armored fighting vehicles. They took note of the weight limits on bridges, as well as their fuel consumption rates. “We’re focusing on logistics,” Ludwig said. In the Baltic countries and Poland, the past casts a long and influential shadow over the present. For their part, U.S. troops are adjusting to a role they infrequently experienced in the post 9/11 counterinsurgency era—that of welcomed defenders. As the U.S. troops convoyed across former Warsaw Pact countries and Soviet states, you frequently saw people waving American flags on the roadsides. At that sight, you couldn’t help but think of pictures of liberated populations celebrating the arrival of U.S. and Western Allied troops in World War II. 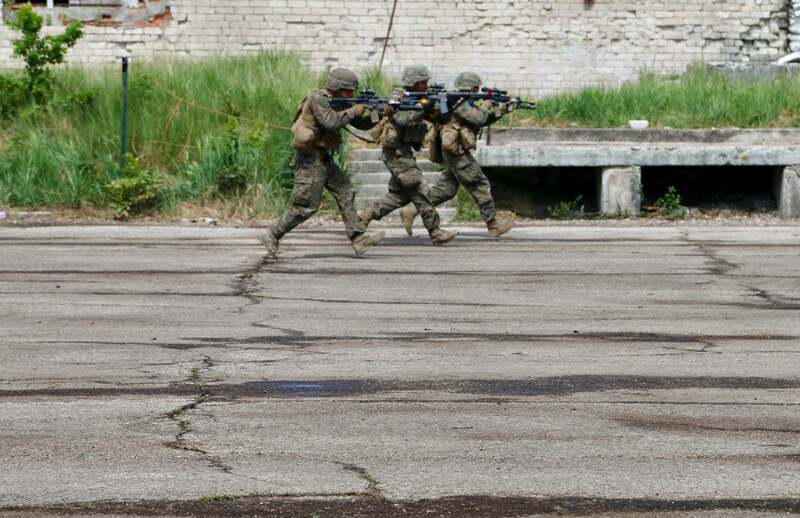 Spanish soldiers at the Skrunda-1 military training range in Latvia for the Saber Strike exercise. For most Americans inundated with the steady stream of fractious political news back home, it’s easy to overlook or underestimate the tectonic geopolitical shifts going on in Eastern Europe in our time. It’s also easy to forget that the U.S. military and its NATO allies like Canada are still seen as a force for good and a beacon of hope for people who can remember what the alternative to freedom and democracy looks like. 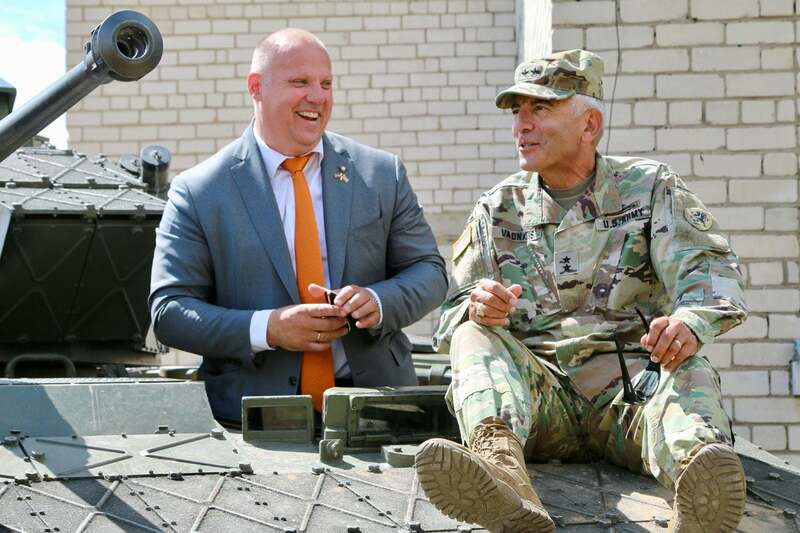 “It’s remarkable how much the people in this region appreciate their freedom,” said Maj. Gen. John Gronski, deputy commanding general of the Army National Guard, U.S. Army Europe, who was in Latvia for the Saber Strike exercise. “The taste of freedom and democracy is still fresh, and the people here certainly appreciate what NATO and the U.S. have done for their country,” Gronski said.